The usual post Stride Pro Wrestling buzz I feel on a Sunday after a show has been replaced with pain. We had a great show and our host John A. Logan College was more than accommodating to us. A full recap of the show will be a part of Monday's My 1-2-3 Cents podcast on the Jittery Monkey Podcasting Network. So why am I in pain? I'm glad you asked. Quick backstory. 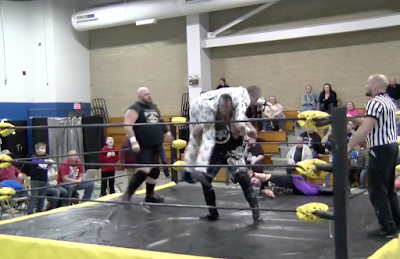 You may remember my blog from last month when Roger Matheus attacked referee Lane Austin after being disqualified in his match against Stride Pro Wrestling Heavyweight Champion Jay Spade. At Saturday night's show, Matheus confronted General Manager Sam Hunter, demanding another title match. Spade was defending against Bull Bronson and Matheus found that unfair. Hunter's compromise was to put Matheus in the Stride Rumble, which the winner would be deemed number one contender. Matheus made it to the final two but was dumped over the top rope by a sneaky Tony Flood. Fast forward to the match between Bull and Spade. As Spade climbed the top rope, Matheus emerged and knocked the champion off. That meant Bull would be disqualified and as you can imagine that angered the 400-pound beast. He and Matheus went nose to nose. I turned around to put the mic away because the night was over at that point. Bull left the ring and exchanged high fives with fans. Little did I know, Matheus exited the ring to and came up behind me. 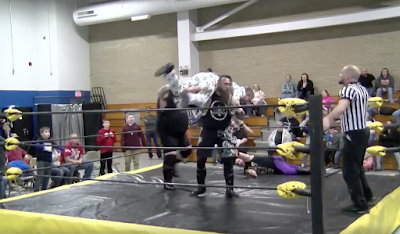 He grabbed me and threw me onto the ring apron. My back hit the bottom rope and I bounced back like a rubber ball. Matheus rolled me again and I ended up in the middle of the ring. Matheus came in behind me and I remember seeing his giant boots and begging him not to hurt me. The next thing I know I'm on his massive shoulders. I could see Lane pleading with Matheus to put me down. A moment later, I felt a tug at my waist. It was Bull pulling me to safety. I hit the mat and quickly rolled out to the floor. Bull then nailed Matheus with a right hook. Matheu rolled out of the ring but jawed more with Bull. I'm sore, but feeling good that Bull was still close by and made the save. I have no doubt I'd likely not be capable of writing his blog today had Matheus had finished what he started. Now he has Bull to contend with on Saturday, March 3 at Christopher Grade School.